A former patient recently contacted me letting me know she was being interviewed for a podcast called The Voice of the Patient with Dave Reed, PT, MBA (listen to it here). Christy asked me for assistance recalling the history of her case to prepare for the interview. She also agreed to let me comment on her case on our blog after I heard the podcast. It is a story that has to be shared. Please listen to the podcast, because I can only cherry pick the most valuable pieces, but I also share some other aspects she did not mention gleaned from documenting her care. Ultimately, Christy has made progress back to defining herself by much more than being a ‘chronic pain patient.’ She is a strong, robust, resilient, active person, and she believe that. Christy sums it up best in the interview stating, “What I hope people get out of my story is pain can get better.” “You’re not put into a class of people that there is no hope for.” I also learned a lot during my experience with Christy as I often do with patients who present a real challenge to help them reach their goals. I will share those key points that were reinforced by reflecting on our interactions together and the story told through her words in the podcast. I met Christy on November 17, 2014. I was not her first physical therapist for right hip pain that began months before in the summer of 2014. Looking back at the initial evaluation record, I was supposed to serve as a 2-3 visit “second opinion” at the recommendation of her surgeon. We agreed to work together every other week as she continued to be treated by her first physical therapist at another clinic. This went on for about 4 months before she transitioned full time care with me. Further, it turned out to be more than ‘just right hip pain,’ but also right thigh muscle pain, left posterior pelvic pain, and occasional upper back pain. This is often the case when someone is experiencing pain they are seeking medical help for even though it can be easier to mentally compartmentalize the pain into one spot of blame. She was really struggling to perform her job, to sit or stand for short periods of time, and even to walk her dog after work, which were what was meaningful to her. Christy happens to practice physical therapy in one of the more physically demanding careers in pediatrics working with children who have neurological conditions, so there is a lot of hip and back bending movements, sitting on the floor, and lifting to transfer patients. She had stopped exercising because it was too painful, though it was something she enjoyed. A key point is that she was already starting to restrict her activity to try to heal. Prior to the hip condition, Christy had dealt with low back pain for 6 years, as she mentions in the interview, with about 1 ½ years of pain-free activity 2 years after a right sacroiliac fusion and left sacral fixation. She also let me know she had a labral tear in the right hip and pelvic obliquity. I thought to myself, “Who doesn’t [on both counts]?” We discussed natural human asymmetries and how common labral tears are in people with or without pain, though she thought she still might need surgery to repair it as she mentions in the podcast. Furthermore, Christy reported she had a connective tissue hypermobility syndrome. The theme was that Christy was describing a series of “pathoanatomy” and associating her pain with structural “abnormality” diagnoses. She says in the interview, “I don’t know why I was fishing for somebody to tell me, oh yeah, what you have going on is really bad.” Imaging like MRI enables us to focus on anatomy, which can be very helpful, but also can create a nocebo effect, or a negative psychological effect for no reason. Movement diagnoses can also have a nocebo effect, as a fear of movement can develop. I do not mean to overly downplay certain aspects of her medical history. The position of her pelvis matters because it can affect movement strategies, hypermobility syndromes are a real confounding factor, as are surgical compensations that limit motion. However, these factors do not sentence a person to chronic pain. Christy was crossing into a state of chronic pain again, just like she had experienced for 6 years with her low back. In the interview, Christy uses words like fear and doubt. She says, “My hope to be pain-free didn’t seem to be possible.” She talks about how she “traded one pain for another.” She needed an internal locus of control to start making progress. That’s to say she needed to believe she could create the change in her life. As she mentions in the interview, she was “skeptical” of me at first. It was important for me to avoid creating a level of dependence on me for her sake. Being in alliance with her and guiding her ability to better control her body to find ways to minimize her pain experience was my goal. Reviewing her chart notes, Christy’s pain experience was pretty mixed through 4 months of care. She would report improvement, but with an increase in work stress (physical or mental), her symptoms would worsen. She needed another boost. What Christy needed was more of the right information, the right language to communicate with, a change in her beliefs about her pain, and an opportunity to adapt. Now I think this was a huge part of her healing process, but I also found that around that time, Christy had taken 1 week off of work, had a student physical therapist starting to help with the physical workload of her job for 2-3 months after that time, and she would be transitioning to a 32 hour work week in July 2015. I believe this was the opportunity Christy needed to heal. I believe her adaptive capacity had been exhausted prior to this point and her ability to add new activities had been restricted. What cannot be downplayed is the amount of intentional, focused work done by Christy. She wanted to get better, and she was seeking out the right information. She followed direction and had trust in multiple people who believed in her. She also was diligent about her movement training and strengthening exercises that enhanced variability in her movement strategies, ability to control her body, and physical stress/load capacity. My last comments before reminding you to go listen to her story is that Christy needed to find something meaningful to her to transition to, so she could continue to progress. 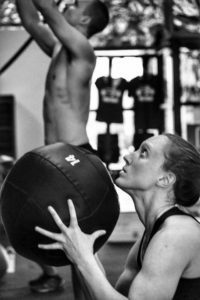 Another pivotal moment for Christy came during a trip Chicago to hear her friend Antony teach a course at a Crossfit studio. She was again challenged to perform movements that she still had fear of. I believe the challenge to perform in a new environment in front of a new audience was another cognitive reframing moment for her. After that experience, Christy and I were able to push her physical capacity even further. The rest is history. 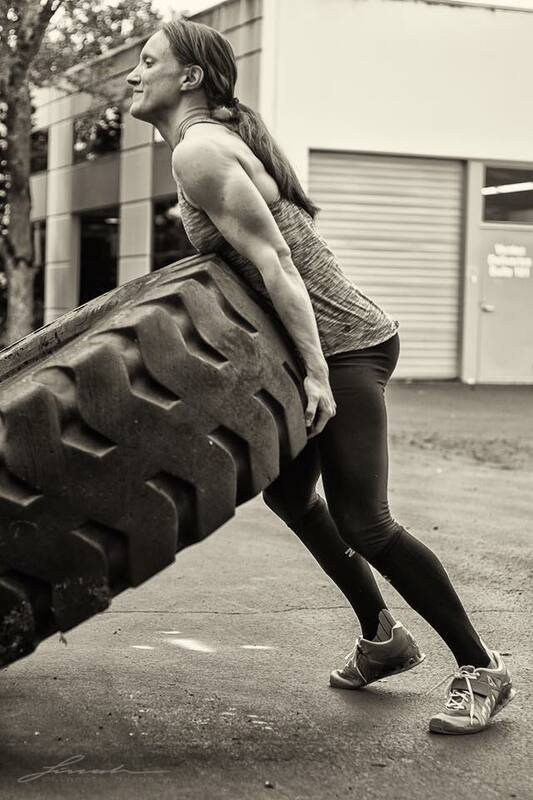 Christy found a Crossfit group in Bothell near her home, and started going regularly as our treatments tapered to email communication after September 2015. I communicated with her coach, Rich, to share where Christy was in her rehabilitation process, and they listened to Christy, onboarding her gradually. Christy has now been a regular Crossfitter for just over a year. We have also worked together a bit on running technique to supplement her ability to participate fully. This does not mean that these are the activities everybody needs to do to get out of pain, but these were meaningful to Christy. Humans need to find ways to be challenged and to be creative. Christy found that. There is a saying “it takes a village.” Many people were involved playing a supportive role for Christy, though she sought it out, and she made it happen. Hers is a story of resilience, perseverance, reframing negative thoughts into positive thoughts, and of challenge and progression. And thank you for your permission to share, Christy!